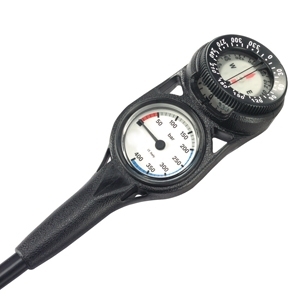 MINI HIGH-PRESSURE GAUGE AND COMPASS WITH BOOT AND 32" HOSE. Graduated 400 Bar full scale. Luminous easy to read dial design. Red zone from 0 to 50 Bar. 10 Bar ingrements shown across the scale. Oil filled compass with top or side view. Very fast response, -2 Magnets. Silk screen printed numbers on bezel. Features a plastic boot with fixing loop.